So you’ve decided to take the plunge and start cooking Vietnamese food. Congratulations! Prepared properly, Vietnamese food is healthier for you, it just plain tastes amazing. Learning a new cuisine can be fun but daunting too. It is like learning another language. Not only are the ingredients (words) different, but the ways to cook the dishes (grammar) is foreign too – the classic flavors of sweet, bitterness, savoury, salty, sour and fatty are combined in different ways. However, with the right ingredients and guidelines, you will soon find yourself well-versed. Below are links and resources to help ease your introduction into cooking Vietnamese food. Before we go any further, let’s take a moment to consider what you will need to make most of the Vietnamese food, how to buy the right items, where you can find them and more. 16 Essential Vietnamese Ingredients That belong in your pantry – In this interesting article, you will learn 16 essential Vietnamese ingredients that you can find in every Vietnamese household. If you want to buy some of these items, you may want to check for an Asian or specialty grocer near you first, as they may not be found at every supermarket. How to Buy and Use Fish Sauce From Viet World Kitchen – In almost Vietnam household, you will find that a meal is not to be had without fish sauce (Also called nuoc cham in Vietnam). So if you decide to learn Vietnamese Cuisine, you cannot miss out this one. This comprehensive article will help you learn more about this kind of sauce. Furochan Eats: A guide to buying fish sauce in Vietnam – This is another buying guide on “nuoc cham” – a main sauce of Vietnamese food. It features a lot of fish sauce from popular brands in Vietnam. Furochan Eats: A guide to buying fish sauce in Vietnam – In this page, you will find a huge list of Vietnam grocery shops from everywhere (Melbourne, Sydney, Los Angeles, Chicago, Boston, London and more). Check it out and find your nearest shop. If you are in London, you can find some Vietnamese ingredients such as fish sauce, palm sugar and rice noodles on these sites. Pronunciation of Pho And Other Vietnamese Words and Phrases – As I said, learning a new cuisine can be hard and confusing. It’s true if you’ve never learned the Vietnamese language. So it will be helpful if you learn how to properly pronounce certain words in Vietnamese to get to know Vietnamese food. This page aims to help you with exactly what a phrase should sound like. Top 10 Vietnamese Dishes You Must Try! 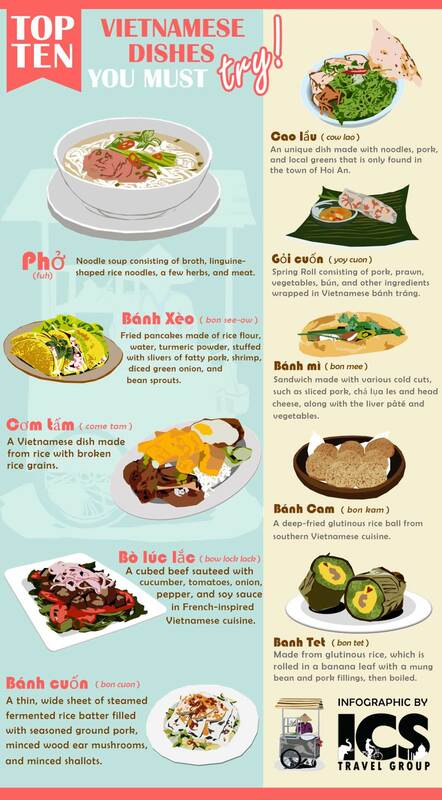 [infographic] – Before we go to the next section to learn more about Vietnamese cuisine, you may want to try some delicious Vietnamese dishes. A basic introduction to Vietnamese food – This article contains most of the things about Vietnamese cuisine from Geography to basic elements. If you are new to Vietnamese food, there you go. Here, Eat this: A beginner’s guide to Vietnamese cuisine – This is the list of the most popular dishes in Vietnam like well-known Pho, are representative of the northern part of Vietnam and other tropical dishes. All of them are really delicious. Profile of Vietnamese cooking and culture – Vietnamese food differs from north to south. The colder Northern region is known for its hearty beefy stews while the South’s cuisine is rich with fresh seafood. This article has a lot of interesting things related to Vietnamese cooking and culture. Cooking methods in Vietnamese cuisine – There are a number of cooking methods that you can find in Vietnam. In this post, you will learn some of them. Tips for cooking Vietnamese food – One of the fast ways to learn something new is learning from others who’s been around the block several times. That said, you can learn lots of advice and tips for cooking Vietnamese food in this article. Chef tips: Master Vietnamese at home – You will find some useful tips for cooking Vietnamese food in this page. 60 Authentic Vietnamese Recipes – Looking for Vietnamese recipes? Check this page from All Recipes to discover more than 60 authentic Vietnamese recipes with advice, cooking tips, rating, and reviews. Peanut Sticky Rice (Xoi Dau Phong) | Runawayrice.com – Peanut Sticky Rice is delicious and easy to make that you can have for breakfast or dinner. To make it, all you need is the right recipe, good ingredients, and a rice cooker. Check out this simple recipe from Run Away Rice, try it yourself and you can have your own Peanut Sticky Rice within 1 hour. Easy Vietnamese Recipes – You will find a bunch of easy Vietnamese recipes on this page. These recipes are not only very delicious but also easy to make. It’s easy so much so that even you can master them in no time. If you’ve traveled to Vietnam, chances are you’ve had these amazing foods since they are main dishes in every Vietnamese family meal. These foods are also a great choice for your family meal, especially when you’re short on time. Đậu Hũ Chiên Giòn (Crispy Fried Tofu) | Vietspices – This dish is very simple and easy to make! With the recipe and some easy-to-find ingredients, you can make a new dish for your family meal. Vietnamese recipes – Try a fresh and fragrant approach to Vietnamese cooking with these simple and delicious recipes along with ratings and reviews. User Guide To Making Vietnamese Spring Rolls – Cha Gio – Cha Gio, the traditional Vietnamese food, was originally made for royalty. Cha Gio is not only healthy but also have a good balance of the yin and the yang according to Vietnamese culture. With 7 simple steps in this post, you can make Cha Gio like authentic Vietnamese Cha Gio. Personally, I like this food. It tastes great and funny too. Why funny? Well, give it a try! Vietnamese recipes | BBC Good Food – Still looking for Vietnamese recipes? Check 30 Vietnamese recipes from BBC Good Food to get the fresh flavors of Vietnamese-inspired cuisines right in your kitchen. Noodle pie is blogged up by freelance journalist, Graham Holliday. He is also the author of Eating Việt Nam – Dispatches from a Blue Plastic Table (March 2015), and Eating Korea – Reports on a Culinary Renaissance (March, 2017). In his blog, you will find a lot of things about Vietnamese cuisine and Vietnamese culture as well. This site is created by Andrea Nguyen. She is a food writer, cooking teacher, and chef living in the San Francisco area. She is also an author of many bestselling cookbooks on Vietnamese foods. The Pho cookbook for example. It’s worth a visit to check out the practical advice, tips, how-to articles, and other free resources she offers on cooking Vietnamese food. http://vietworldkitchen.typepad.com – If you want to know more guide from Andrea Nguyen, check this site too. In Vietnam, pho can be eaten morning, noon and night. This authentic pho isn’t quick but it is delicious. With a straightforward recipe, it’s not hard to make Pho. But to make it like an authentic Vietnamese Pho, you need to learn some more advice and tips. And Loving Pho is the right site to visit when it comes to authentic Vietnamese Pho. Check it and make your own Pho. Vietnamese Street Food is one of the dishes you may want to try when you go to Vietnam. It’s simple, unique, and delicious. Sai Gon, Vietnam is famous for its street food. If you go to Sai Gon, you may want to spend much time on the streets eating and enjoying Saigon. In this site, you will find high-quality articles with many real and beautiful photos on Saigon street food. The Viet Vegan is a personal food blog by Lisa Le. This blog features Vietnamese food recipes, personal guide, tips and many cooking videos as well. This personal blog is created by Trang – a recipe developer & blogger. If you are anything like me, when seeing her blog the first time, you may think “While the blog content is full of rice, then the blog’s name is Run Away Rice lol”. Luckily, she cleared things up in this page, check it out if you’re like me. In this blog, she takes traditional Vietnamese recipes and gives them a modern twist (As she said). And you will find a number of traditional Vietnamese recipes, how-to videos, tips and shortcuts as well on this site. This is another great blog about Vietnamese food. As its name suggests, this blog is full of the spices of Vietnam. It’s started by Loan Aka Annette – A Vietnamese blogger. The blog is a cooking journey and has a ton of Vietnamese food recipes. Want to know more about her cooking journey? Come to her blog!